Whether you like it or not, streetwear-inspired hoodies and sweatshirts have quickly become the hero pieces of 2016. Blame it on Vetements, blame it on Kanye, blame it on Chrome Hearts; however you choose to spin it, there’s no denying that they’re on the forefront of fashion, especially for fall. And, truthfully, we’re not mad about it. Whether you opt to wear one alone or layered under a leather or jean jacket, they really do look cool for going anywhere from a coffee run to the club. Plus, from high-end designers (like Kendall Jenner’s $885 Vetements pick) to the H&M and Topshop versions that, between us, do the trick too, all your favorite brands and retailers have hopped on the cool and comfortable wagon, so the options are endless! Shop our picks below and prepare to become a streetwear convert! Of course Reformation is on board. So, this is a men's sweatshirt, but we would totally wear it anyway. We love the low-key style of this font. These sleeves will look so cool peeping out of a denim jacket. Style this sweatshirt with a denim miniskirt for an ultra-forward look. This will lend itself to so many stylish airport outfits. Stand out in this under-the-radar brand. We've never loved mint green as much as we do right now. This is the brand you're about to see everywhere. Ganni's basics are always better. Beyoncé-approved and affordable? Sign us up. This neckline detail is unexpected and amazing. The Vetements originals are, of course, the blogger and celeb favorites. Stand out in this unexpected color. 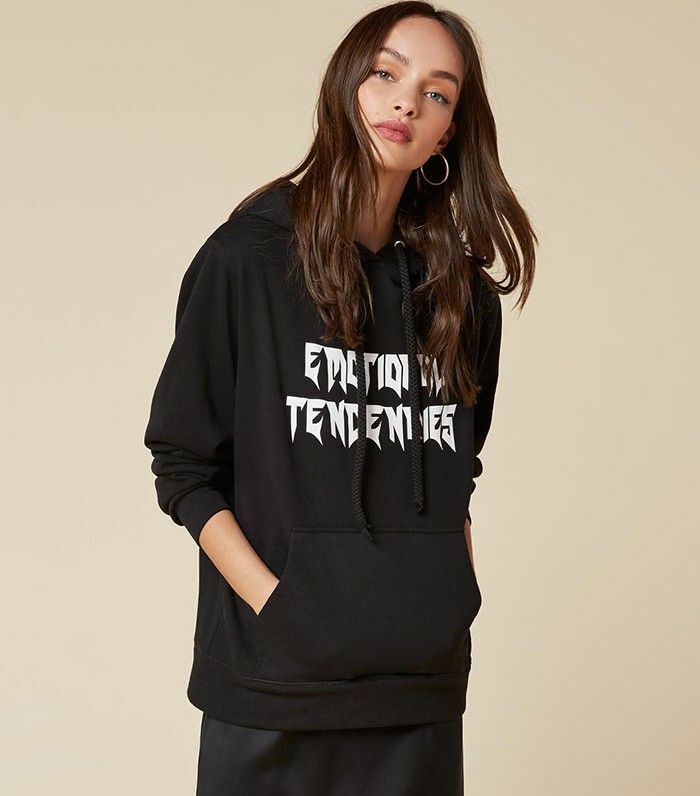 For an approachable take on the trend, opt for this aptly named simple hoodie. We bet this knitted hoodie is SO comfortable. Speaking of streetwear, check out the cool new collab from Alexander Wang and Adidas!